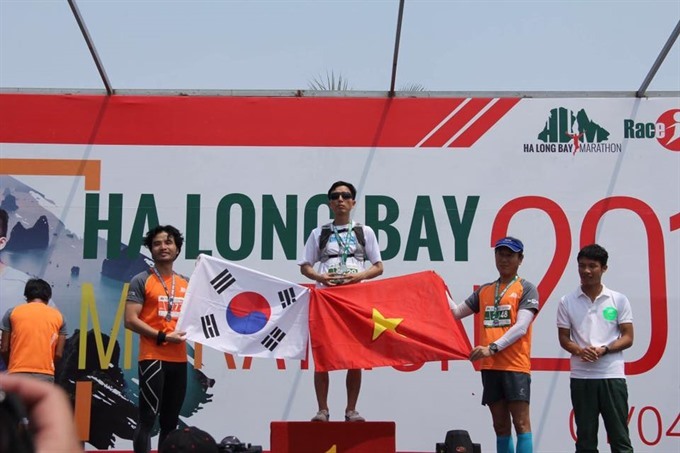 HÀ NỘI — Nguyễn Huy Việt has became the first Vietnamese blind person to complete the Hạ Long Bay Half Marathon (21km). “I could achieve this result because of the support of my wife, who used to wake up early to train with me,” said Việt, chairman of the Blind Association in Hoài Đức District, Hà Nội. Led by Giho Kim, a volunteer from South Korea, Việt on Monday reached the finish line in three hours and four minutes. To prepare for the event, Việt and his wife trained for an hour every morning for more than two months. “We did not get much time as we both work and have two young children to look after. But I am happy that my wife supported me although she does not like sports much,” said Việt. Thirteen years ago, he joined the Khúc Hạo Sports Club and won gold medals in high jump and long jump events at the National Sports Games for disabled people in 2015. After that, he stopped training and competing due to work. He now aims to compete in the 42km and even 70km categories in the Hạ Long Bay Marathon next year. “I used to climb to the highest peak of the Tây Thiên Pagoda in Tam Đảo District in Vĩnh Phúc Province. It is a driving force for me to overcome obstacles in life,” he said.